No one screams for ice cream like 'Ye—in honor of his 38th birthday, we imagine a fantasy frozen-treat's emporium worthy of Yeezus. CLICK HERE FOR KANYE ICE CREAM WEEK SEASON 2! It’s been great watching Kanye finally achieve his dreams in the cruel world of fashion this year. But as he knocks down one barrier after another, we couldn’t help but wonder if he was putting his eggs in the wrong basket. Kanye talks a lot about his aspirations reaching far beyond music and design—he wants to make the world awesome in all aspects. Sometimes that bullheaded mission leads to adversity for the divisive star—the type of conflict that makes a guy go off and create a brash, discordant album like Yeezus. But amidst the Good Life highs and the Black Skinhead lows, one thing has consistently made the weary Kanye West happy (besides, you know, we’re assuming, his beautiful family): ice cream. 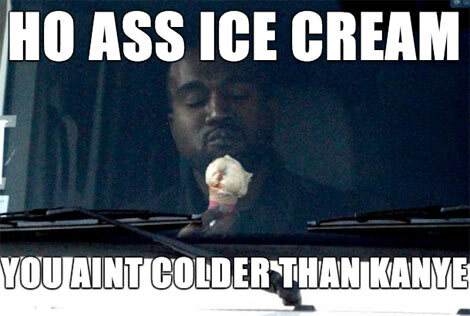 Go ahead and Google image it—Kanye is positively beaming anytime he’s near a scoop, even if it’s plain vanilla. Adidas Yeezy Season is cool and all, but why not channel that entrepreneurial energy into the very thing bringing light to your dark twisted life, ‘Ye? 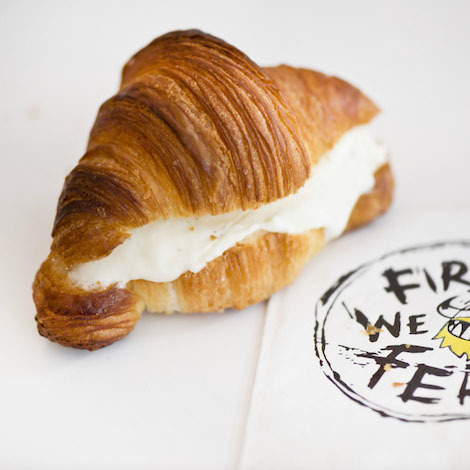 Can you imagine the minds behind DONDA whipping up soft-serve creations for your pleasure? Well, now you don’t have to, because we did the imagining for you. To show Kanye the possibilities in the world of frozen confections, we’ve created a partial menu—complete with flavors and sizes—of the game-changing parlor he’d surely create if given half a chance. This is just the tip of the ice…cream. Fashion is cool, ‘Ye, but we’ve found your next calling—and what better time than your 38th birthday to plot your next move. Click through the slide show above to see the full menu of Yeezy-inspired flavors. A sorbet for all Yeezy Seasons. Nike and Kanye may have parted ways, but the art created from that failed union is timeless. The best pre-adidas Yeezy silhouette is honored through Kanye’s favorite frozen treat of all: sorbet. An instantly iconic lyric deserves special treatment. One bite may have you talking to Jesus. Happiness is an ice cream alone in the car. The best picture on the Internet, reprinted on ice-cream cake for your edible pleasure. May eating a slice bring you the same joy this cone brought Kanye. A new classic—the perfect treat 24-7, 365 days. How long y'all spent at the mall? Hopefully not all day, because then you'd be stuck with Dippin' Dots and struggle scoops, when you could be licking some high-grade ice cream made with premium Tahitian vanilla beans. Like a Kanye x APC white tee, this minimalist flavor will never let you down. Stop everything you’re eating now, this sundae is awesome. The ultimate homage to Kanye’s self-proclaimed perfect chick: the most intriguing and beautiful woman on the planet. Be warned: You’re not even permitted to look directly at this sundae for the first few minutes after it’s placed in front of you. Bask in its exquisiteness, then dig in—but not before taking a thirst-worthy selfie, natch. Kanye Ice Cream IRL: Try these flavors now! Not content to simply daydream about the Kanye ice-cream parlor of the future, we decided to make it a reality: For a limited time only (June 8-13), we&apos;ve partnered with our friends at Morgenstern&apos;s in NYC to present #KanyeIceCreamWeek, where you can get your hands on real-life versions of some of these Yeezy-inspired treats. Check out all the vital deets here.